If a co-workers calls your mobile phone, you may not recognize the phone number. Even though you can look them up in the GAL, their Caller ID won’t display a name or photo because they are not in your contacts. You can learn about other related smartphone contact challenges if you read 14 reasons to sync to the GAL to smartphones. To be able to take advantage of Caller ID when a coworker calls, you will want to sync the GAL (Global Address List) to the contacts folder of your Exchange Mailbox. This solution works because iPhones and Androids use Activesync to sync mail, calendar and contacts from a mailbox to a smartphone. From a company perspective, placing the Office 365 GAL contacts in each user’s mailbox creates a little bit of magic. Every smartphone gets the correct coworker contacts and users don’t need any training. Those smartphone users now have a fully populated address book for text messaging, email and phone calls. If your organization uses Office 365 for hosted Exchange, this post will show you how to sync the GAL to Outlook contacts for all smartphones in your organization. If you would like to try this out first on a smaller scale, you can use CiraSync Personal Edition to demo GAL Sync on exactly one mailbox. If you prefer to watch a video demo of these steps, watch it on Youtube. Before we start, this blog post assumes that you have logged in to the CiraSync EE dashboard, granted consent, and setup appropriate permissions. To start the sync configuration, login to your CiraSync tenant dashboard, click the plus sign (1) located in the Contact Lists window. First we will select the type of contact source. In this example, we will use Global Address List (2) as a contacts source. 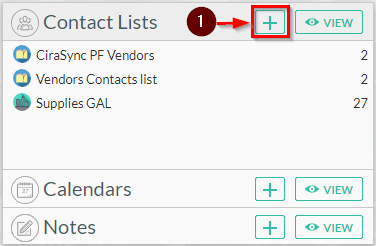 Step 1 of the GAL Sync wizard is displayed and we have two predefined lists: All Mailboxes and All Contacts. In this example, we will sync both All Mailboxes and All Contacts. Click the SEARCH tab and select the GAL All Mailboxes (3) and click on the plus sign (4). In the column on the right(5), the GAL source selections are displayed. Click Next (6) located in the upper right to proceed. In step two of the wizard, you will choose the targets. This is typically the users who have smartphones. Thus, a target is one or more mailboxes. You can pick specific mailboxes from the GAL, a GAL Distribution List, or you can use a Collection. A Collection will allow you to combine one more GAL groups, one off recipients and even exclude specific users from a group. Use the Collections tab if you want to push contacts to a collection of users. The sideways tab located on the far left side. The Search tab is used to add users and groups directly from the GAL. In this example we will set exactly one user as a target. Since the search tab is the default selection, use the edit box to enter part of a name or group. In this case, jss is part of the email address of a user mailbox (7). Last, click the plus sign (8) to add it to the list of targets on the right column of the wizard dialog. An option to generate smartphone contact for any GAL Distribution Lists that are included in the source. The subfolder where contacts will be synced to each target mailbox. You can use the default contacts folder, or you can create a unique sub folder. In the Provide Contact List Name edit box(10), enter a contact list name. It’s really important to be as descriptive as possible for the name of this list. CiraSync will use this name as a category on each synced contact. For this example, we will omit the checkbox Sync Group as Contact. Choosing to save the list to the default Contact folder is not recommended. A subfolder will keep each user’s personal contacts separate from the replica of the GAL contacts. In this example, we will create a subfolder. Next click the plus sign (11) next to Contacts then Enter the subfolder name… (12) of your preference. You will see the sync summary (14) from this page, it is also showing the contacts source and the target (15) users. Now click on the CiraSync icon (16) located at the upper-left hand corner to go back to the main dashboard and run a manual sync. There are two methods in running a manual sync, first, you can click on the Sync Now (17) button located at the upper-right hand corner of the page to force a sync operation for your entire tenant. If you already have many tenants set up in your CiraSync tenant, it could potentially take many minutes to hours to complete a sync task for all licensed mailboxes. A second method is to scroll-down at the bottom of the dashboard to the Mailboxes grid. In the edit search box (18), search for the name of the target mailbox you specified in step (7). If the mailbox is not licensed, first click on the license button (19)> It should turn green. Next, right click on the row of the target user mailbox (20) and select Run Mailbox Sync (21). Run Mailbox Sync dialogue box appears, click OK (22). You will see the sync progress from CURRENT TASK (23). The example below shows the results when sync operation is completed (24). Now you can check the target mailbox (and subfolder) for the sync replica of the GAL contacts. These contacts will also appear on the smartphone for the target user. On an Outlook Desktop, open the target user’s mailbox. Click on the People (1) icon at the navigation pane to access Contacts. You will now see the synced contacts Suppliers GAL (2) and the contact records (3) after pushing it through CiraSync. Check the Suppliers GAL from Contacts Group. In the native contacts, it’s now showing the 35 contacts from the source you set in (15). Check the Suppliers Mailboxes from Contacts Group. In the native Contacts, it’s now showing the 35 contacts from the source, Androids shows the contact list name you set in (10). Note: Some Androids only sync the default Outlook contacts folder. This is due to fragmentation of Android OS versions across different manufacturers and hardware platforms. The viewing of Contact and Calendar subfolders can vary from phone to phone. LG G-series will merge them all into the main Android contacts location in most cases. Microsoft has an OWA app for Android that displays contact and calendar subfolders (their standard Outlook for Android does not display subfolders at this point but may in the future). If you need technical assistance with CiraSync, please contact our support staff.